BLENHEIM, Ont. — If there’s one thing Steve Hibbert believes in, it’s treating his employees and customers like gold. SM Freight was founded at the turn of the millennium by a local Blenheim, Ont., resident. By 2007, he sold the company consisting of close to 30 trucks to Hibbert. Today, the fleet consists of 84 trucks and 140 trailers, 60 of which are reefers. Mostly, the company hauls produce, other food products, and pharmaceuticals to Washington, California, the midwestern states, and Quebec. Driver turnover is pretty standard, according to Hibbert. Those who leave, “think the grass is greener,” Hibbert said. 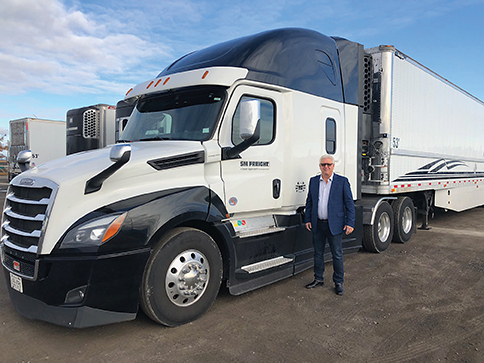 Those who stay, do so because SM Freight is committed to continually increasing wages for drivers, having great benefits, and driving clean, new equipment, Hibbert said. Hibbert recalled one instance when a driver came to him after his wife ran up all of his credit cards. Hibbert is also a big believer in treating customers right. Right now, the business isn’t suffering too much from the driver shortage, but Hibbert said more trucks than usual are sitting empty in his yard than he’d like. To help fill his trucks again, Hibbert said SM Freight is actively trying to participate more in recruitment and job fairs. “And we’re going to have to look at the U.K. or the South Asian population in Toronto to recruit more drivers. The local farm boy isn’t walking in off the street anymore,” he said. In the near future, Hibbert said he hopes to continue to grow the business to double its current size.